There are 5 ways to import source image into FantaMorph. 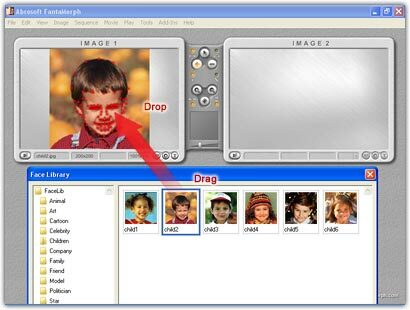 As described in Lesson 1, the simplest way is to click Import Image button or the Image/Import Image menu, then choose an image file from the Import Image window as shown below. Double click directly on one of the two source panels to launch the Import Image window. When choosing from many source files, finding a particular source image may be difficult. 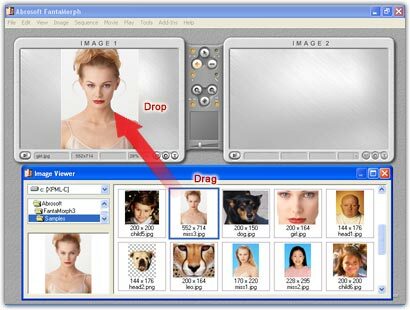 In this case, press the CTRL + F1 key or choose the Add-Ins/Image Viewer menu, and the image viewer will appear. Adjust its window size and position as suited for viewing. Use this simple, fast tool with thumbnail previews to explorer all supported image resources on your disks. Click on the desired file and drag it to the image area in the main interface. You may also drag an image file to the main interface from an external program such as Windows Explorer or ACDSee. Beginning with version 4.0, you can drag a face from the Face Library to the image area in the main interface. In this way you can also get the aligned key dots that has been stored in Face Library.